Home » Forum » Trade Talk » Flooring » I Did Something Terrible..
After we did the floors, we started working on other stuff, and one of the bathrooms cupped and crowned like mad, I spent a full 10 hours hitting that bathroom again with a belt sander and then a palm sander and then another day refinishing it. The floors sat and looked fine for a couple weeks after that.. then we got kicked off the job when an inspector came through to look at the plumbing and most of it had to get ripped out. I'm sure it failed framing inspection and everything else. I have some real horror-show pictures that I took of things the contractor did while I was at the beach for a week. Too lazy to route a pipe around a joist or do the appropriate hole cut, and not having me there to do it for him, he cut the middle of a joist out completely in the basement thinking no one would notice. I fixed that myself, sister-ed the joist on both sides when I came back and cut his pipework out. I'm not liable for anything, even the homeowner knew my story from the very beginning that I was a hired helper with no background in carpentry. The contractor I worked for has no business owning tools. I'm not sure if I regret this whole experience, or if I'm glad to have seen how bad it really can get with some people. I'm getting in the mindframe that I want to take up contracting full time but I got a lot to learn since the first couple clowns I worked for were... clowns. What's the proper way to do this! and if I can contact the owner, to ask about the results, should I do it given the scenario? Last edited by andrewdouv; 10-05-2018 at 03:23 PM. Re: I Did Something Terrible..
Oh boy at least it looks neat and clean but all wrong. I don't have time right now to list the correct way but people will do that soon here. So, lets install the finish flooring prior to the drywall. And probably without a moisture test on the concrete to boot. Vapor barrier film on floor room up on walls 6" ramset 2x3s on the flat 16" OC to concrete over vapor barrier, 3/4" plywood or t&g plus asphalt paper. Never PT inside a house.... Ever. Best generic solution w/o knowing all the specifics. Why would you go and talk to the owners? You did what you were told. Walk away and move on. It is hour employers pro L em. Honestly though, you do have lots to learn. You aren't ready to be a contractor. Put in 3 or 4 years first. At the least. , you do have lots to learn. You aren't ready to be a contractor. Put in 3 or 4 years first. At the least. "I'm getting in the mindframe that I want to take up contracting full time but I got a lot to learn "
Thanks you for a serious reply with some specifics. when you say ramset 2x3s, this would be like furring strips under the 3/4 ply correct? So the vapor barrier and asphalt paper basically sandwhich the subfloor and keep moisture out, that makes sense to me. 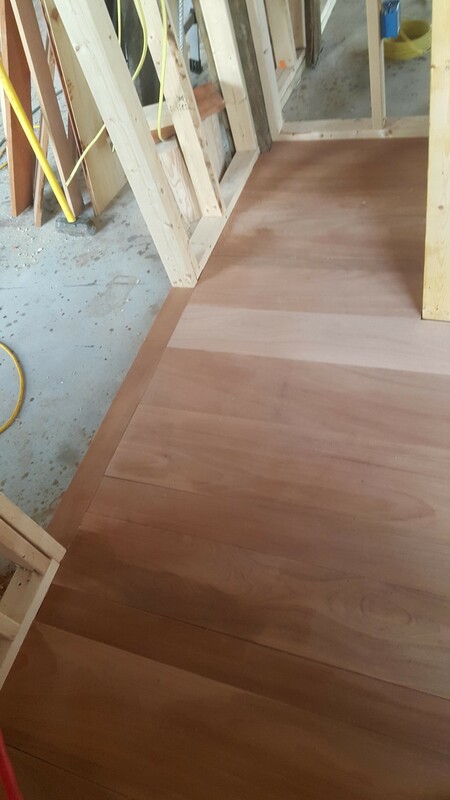 What about the Mahogany floors, how should I have finished them, and how do I create proper expansion gaps? I get it if you guys don't wanna be my encyclopedia on flooring, I'm glad I now know that the work I did was fubar, and everything that guy was telling me to do was bad this confirms everything. I didn't really have anyone to ask before. "Honestly though, you do have lots to learn. You aren't ready to be a contractor. Put in 3 or 4 years first. At the least." --- this is exactly my gameplan. I'm looking for a guy in my area who isn't a POS who I can work under for a few years and learn to do the trade properly. I wasn't expecting to learn how to do flooring on this forum, what I was expecting was someone to tell me exactly where I went wrong and possibly how they'd have done it. Last edited by andrewdouv; 10-05-2018 at 09:18 PM. How long ago was this project? While I understand your curiosity to see past work, and learn from it, which is commendable, in this situation you should just let it go. From the very little that we saw in those pics, and your description of what took place, your former boss was not a professional builder at all. Forget what he taught you and move on. There are plenty of excellent builders out there, even in Seattle I'm sure , and your best bet is to find one, and go to work for him. As less and less folks want to learn the trades, the good tradesmen are in high demand, and if you have a good work ethic and a desire to learn, you should get picked up fast. No moisture test, I didn't know that was a thing til you mentioned it. Got the google education. jeez. This was beginning of 2017, on the east coast. I came out to seattle to work a couple contracts on fishing boats but I brought my truck and my tools and i've got a couple dead months in the winter. Right now I'm doing cutting and installing hardieplank siding for someone. But this is just a temporary gig. I'm gonna start looking seriously soon. I see a ton of ads for framers and laborers, but I think I'm better off trying to find a guy to take me as an apprentice than working for a company doing piece/rate hustle jobs (which there are a lot of). Be careful getting stuck on a piece work/specialized crew. While you'll learn quick and get proficient at one thing, you'll get stuck with that one thing, and it'll limit your opportunities for other work, and keep you from becoming a well-rounded builder. And during the inevitable downturns in this trade, the more you know, the better off you'll be. I started out working for a guy that did a mix of new and remodel homes. I learned a ton about building new, and altering existing structures. People that build new construction will do well to have experience looking at a weathered and aged structure, the materials used, construction techniques of past, and how things have faired over time. You'll be prepared to build a better home with that experience. Keep your attitude, you'll go far. After Install... 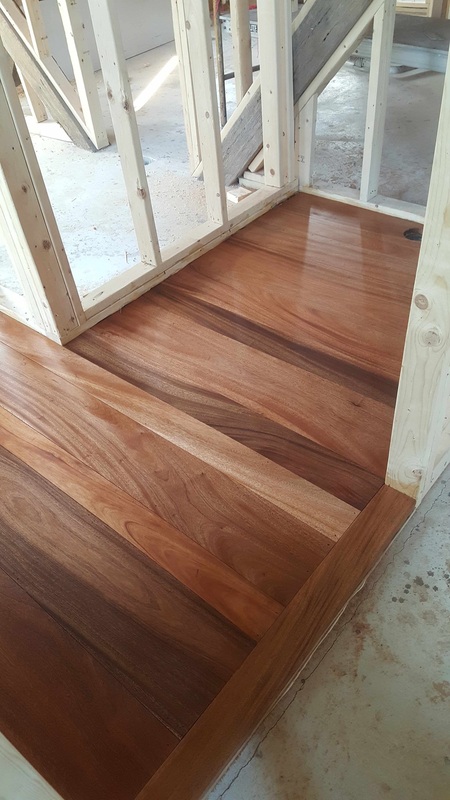 Treat like any other unfinished hardwood install. Sand everything down 40 grit up to 180 grit. With mahogony, use a grain filler. Then seal the floor. Screen buff it and the use oil based urethane probably 3 coats for mahogony. Buff and tack cloth between coats. Only floor guys would know this stuff. GCs can care less about the actual process. Can't beat yourself up too much. That's exactly how I started out, worked for my uncle for three years, doing custom homes on the lake, with the occasional remodel. Learned a little bit about everything from the footings to the trim and paint, the only things he subbed out were plumbing and electric, and I got to be the plumbers helper quite a bit when he was on site. I thank him occasionally for the well rounded start I had, should thank him every time I see him probably.